For the past 5 1/2 years I’ve been a police officer with the Oberlin Police Department. Prior to being employed by the city, I lived in Oberlin until the age of 11 when I moved to the Village of Grafton. Growing up, I became enamored with history due to an exceptional teacher I had while attending Open Door Christian School in Elyria. At the same time, I had a strong interest in law enforcement and investigations due to the fact my father worked as a detective after retiring at the rank of sergeant. 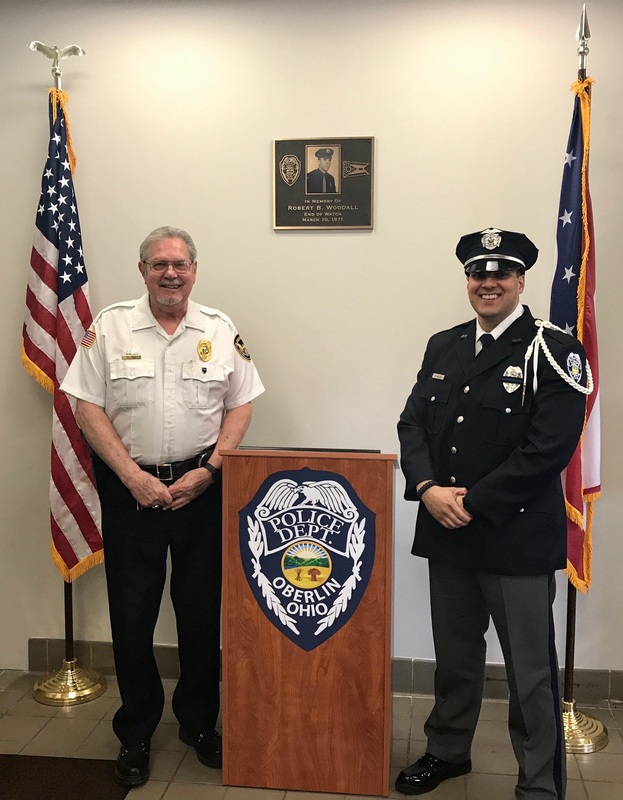 Officer Bashshar Wiley (Right) and his father, retired Oberlin Police Sergeant and current Oberlin Municipal Court Deputy Bailiff, Bill Wiley. My father, Bill Wiley, has seen just about everything there is during his law enforcement career which spans decades. This includes murders, arsons, sexual assaults, robberies, shootings and suicides. What is surprising about this fact is that my dad didn’t work for a police department in Cleveland, Akron, Lorain or Elyria. My dad spent 27 years as a police officer in Oberlin, Ohio from 1968-1995. The quote “it happened in Oberlin” is something I heard many times over the years when my dad would share stories from his career. It’s important to note that while Oberlin is a very safe community, there have been incidents where some dangerous and even deadly occurrences have taken place. Although some of these incidents have been forgotten over time, it’s important to remember there is no such thing as a “crime free” community. In fact, cities and villages, no matter the size, do not have the ability to commit crimes. The unfortunate act of committing a crime is left to the resident or individual “passing through” the city or village to commit such an act. As a 29 year-old man with interest in history and law enforcement, imagine my surprise when my father emailed me a month ago about an officer who was shot and killed in the line of duty way back in 1881 and completely forgotten about over time. This officer was Constable Franklin Stone, and he was shot and killed in Oberlin, Ohio. The information provided to me by my dad began when retired Elyria Police Detective Alan Leiby was having a conversation with Oberlin author, Don Hilton, about police officers in Lorain County who had lost their lives in the line of duty. One of these officers, Constable Franklin Stone, was believed to be from Oberlin. Constable Stone’s name was not engraved on any memorial walls, nor was he acknowledged at any police memorials for fallen officers. There were no streets named after him or buildings constructed in his memory. In fact, there was no information at all about Constable Stone. At that point, the three of us were “all in” with conducting our own investigation into the life and unfortunate death of Constable Stone. From three separate locations, my father, Alan Leiby and I each conducted our own investigation into the Constable Stone case. I don’t know how many times his name was typed into the “Google machine”, in a variety of ways, but anytime information was located, it was shared within our group. Although never in the same room together, we each found clues leading to just what took place back in 1881 on the streets of the “Village of Oberlin” with only a population of 3,242 according to the U.S. Census of 1880. These “clues” consisted of old newspaper articles from The Oberlin Weekly News, book articles, Lorain County court records, gravesite information and even a map of Oberlin dated from 1876. Nothing was more exciting or rewarding than finding an old newspaper article describing the event. In fact, investigations are my favorite part of my job. Using the information we collected over the course of a two-week investigation, we were able to determine just what exactly took place. Franklin Stone was born in Pittsfield Township on August 15, 1835. Stone lived there until 1866, when he moved to Iowa, where he remained for three years until relocating to Oberlin on South Professor Street. Stone worked as an agent for the United States Express Company and also owned/operated a carriage and transfer line. In the spring of 1881, Stone was elected marshal (constable) of Oberlin and New Russia Township. Constable Franklin Stone succumbed to a gunshot wound sustained on May 12th, 1881, after a foot pursuit of a subject whom he was attempting to arrest at approximately 7:00 pm. Stone had arrested a man the previous day in an attempt to serve an assault warrant. The man initially cooperated with Constable Stone and agreed to accompany him to the police station, but then hesitated as they passed a blacksmith shop where his father and brother were working. The family members exited the shop and attacked Constable Stone, allowing the prisoner to escape. Constable Stone swore out warrants for the father and brother and then attempted to serve them the following day. As he attempted to arrest the brother, the man fled on foot with Constable Stone firing at him as he ran southbound on South Main Street. One of the rounds wounded the man, who ran to his home on Mechanic Street (modern day Locust Street). As Constable Stone reached the home, the man’s father stood in the doorway and shot him in the chest with a rifle, causing a serious wound. Constable Stone was taken to his home where he remained until passing away on June 4th, 1881. The man who shot Constable Stone was convicted of second degree murder and sentenced to life in prison. He was pardoned in 1891 due to his old age and frail condition. Franklin Stone is buried with his family at Westwood Cemetery. Constable Stone is one of two Oberlin officers to lose their life in the line of duty. The other being Patrol Officer Robert Woodwall who died in a motor vehicle crash on March 10, 1971 when his patrol vehicle slid off the icy roadway and crashed into a tree on East Hamilton Street. Constable Franklin Stone will now be added to the Lorain County Police Memorial, Greater Cleveland Peace Officers Memorial and his name will be engraved at the National Law Enforcement Officers Memorial in Washington D.C. Unfortunately, Constable Stone’s memory could’ve been lost over the course of time if it wasn’t for the dedication and research of those involved. This includes the work of Maren McKee from the Oberlin Heritage Center who was able to provide me with additional articles describing the incident and even locating Constable Stone’s obituary. Not only is this incident important to the history of Oberlin, but also Lorain County as Constable Stone is now the first recorded law enforcement death in the history of Lorain County. This entry was posted on Wednesday, October 25th, 2017 at 11:02 am	and is filed under History Highlights, Oberlin Heritage Center Collections, Uncategorized. You can follow any responses to this entry through the RSS 2.0 feed. Both comments and pings are currently closed.